You are here: Home / Changing the Nation / What Else am I Supposed to Do? Have you ever questioned God? I know I have, and I assume there’s not a person reading this who hasn’t questioned His reasoning or authority on something. We’re humans. When something doesn’t make sense we automatically look to find who is at fault. When the vase breaks you want to know who broke it. When the car is stolen you want to know who stole it. In the same way, we often question God when we see something happening that doesn’t seem right to us. After all, why would a good God allow something so wrong to happen? We want to know why. It appears only natural to want to know what we can’t understand, and God is pleased by our searching (Proverbs 8:17). He delights in His children seeking to know more about Him. But what happens when we question something about God and don’t like the response we get? What happens when we disagree with God? I think in these times it can be helpful to put things in perspective. We were created. Although our soul has no end, it has a beginning. We are finite, restricted by the constraints of our tiny human bodies and minds. As created beings, we can’t know everything. We aren’t all knowing, and our opinions on things vary greatly with our inherently limited perspective. God, however, is eternal. His Spirit is not confined to a mortal body or limitation of understanding. He is everywhere an all-knowing. His perspective is complete and unhindered, seeing all sides of every circumstance and problem. He was before all and made all, setting the stars in their place with a few words and crafting living souls out of pure imagination. Unlike humans, He has both no end and no beginning. This reality shifts our view. When we realize just how vast the difference between our understanding and His omnipotence is, we begin to see how strange it is that we would question His authority. Have you ever seen a painting argue with a painter over why a certain stroke was placed where it was? Have you ever seen a pot tell a potter how it should be shaped? Of course not! It is the painter who chooses what to color the canvas with, and the potter who decides how the pot is to be formed. 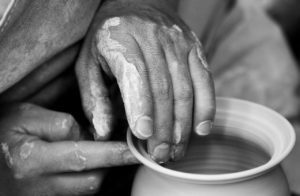 The pot cannot say it was made incorrectly because it’s correct form is that which the potter has chosen. God is all-powerful. In one sense, that can be terrifying. After all, we are defenseless to the desires of such a powerful Being. He could do whatever He wanted and we would have no power to challenge His authority. Thankfully, God isn’t just powerful, but He is also loving. This means that, while He has the power to do all things, He will only do that which is good. We need not fear the wrath of our God, because He has also chosen to be our Daddy. So what do we do when we’re confronted with this amazing reality of God’s incomprehensible might? We submit. Ideally, we submit joyfully, because why shouldn’t we? He chose to create us and save us despite our sinfulness, and I don’t know about you, but I’m kinda fond of existing. It’s good to exist. This submission, it defies our natural inclination. Why would we do what someone else says when what we believe is right? If what I believe and what God believes differs, it’s only natural for me to choose my own convictions first. This has to change in light of His power. My perspective is limited. I know I can be wrong because I’ve been wrong before. I trust my perfect God much more than I trust my own mind, or at least I should. Think about it like this: what would I do if, in the Bible, it said that men must hang upside down once a day? Looks like I’ve got a new hobby. What if he said that men could never shave their beards. I’d probably still not have a full beard, but I’d certainly have a prickly chin. He’s God! What else am I supposed to do? He’s this amazing, powerful, loving, majestic Being who spoke everything I’ve ever seen into existence and crafted a unique soul for every one of the billions of humans I’ve ever met or will meet, and I’m…me. I’m this tiny little creature that is so insignificant compared to His greatness that I don’t deserve a single moment of His thoughts, yet for some reason, He saw fit to call me son. I might not like what He’s asking of me, but what else am I supposed to do? Whatever this Being tells me to do I’m gonna do, and I’m gonna do it joyfully because He knows my name! He knows this little speck’s name.